Baby Crunch, from leboncoin to a cosy corner of his own! I am back in Carcassonne and busy catching up with all the news. I was particularly happy to see this photo of little Crunch, the subject of a post on this blog last month. He was brought to the SPA as his “owners” failed to sell him on the awful internet site, leboncoin (awful as far as their lack of control over their pets and animals adverts, that is), and brought him to us, saying that they had found him in their garden. 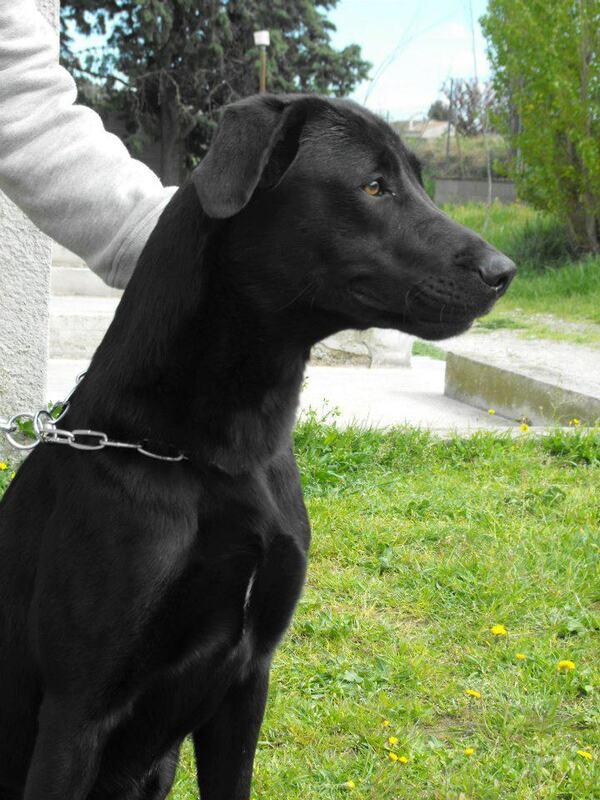 Anyway, Crunch has found a home with a lovely family, and so instead of being sold for 150 euros with NOTHING, he has gone for the same price, but with the crucial 2 vaccinations and a micro-chip. So Crunch will have a much better life; he is identified, as required by French law (though ignored by almost everyone) and with protection against all those doggy illnesses. I think this is a happy ending, and I think that Crunch agrees! Today we received news from several of our alumni. Firstly a lovely photo of Guismo, who was adopted at the grand old age of 10, but who seems to have a new lease of life now he is out of the refuge. 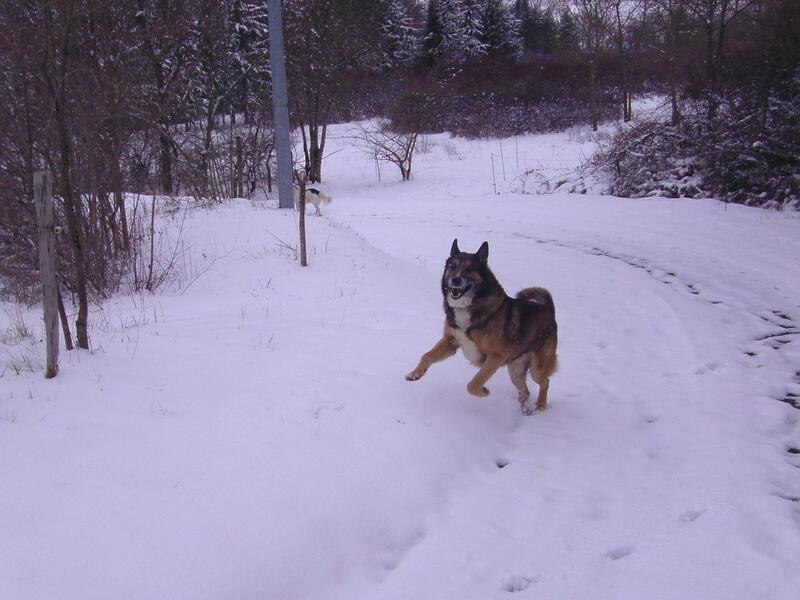 Here he is, playing in the snow. We also received news of Why and Flip, who were adopted thanks to Association Orfee, who came to our rescue when we were overcrowded last year. Supposedly inseparable at the refuge, these sisters are now happily living apart and appear to be thriving. And finally news of everyone’s favourite, Eddy, who was so poorly in the refuge due to a grass seed lodging itself behind his eye. This required a brain scan and an emergency operation in Toulouse. He was then taken under the wing of the association Levriers and Company, and today we found out that his foster family have decided to keep him for ever. RESULT! Busy day, or so it seems! Today has been quite odd, as I have been in transit between Birmingham and London and am now, late at night, catching up with the day’s events, thanks to Facebook (where else?!). Looks like Doglinks has come up trumps for Toby, a small scruffy terrier who was abandoned yesterday, and he will be leaving on Tuesday, thanks to James who is also delivering Mona and Leon to their foster family. A couple of other dogs have arrived, and my cousin, whom I haven’t seen for years, has asked a question on Facebook, so I am hoping that he may come and visit and leave with a dog; you never know! Watch this space! Toby; quick stop at the SPA and off again! The world doesn’t stop while I am away from the refuge, however indispensable I like to think I am! Thanks to my wonderful fellow-volunteers and the SPA Facebook site (www.facebook.com/SPA.CARCASSONNE) I have been keeping up to speed with today’s events during my meetings here in Birmingham. 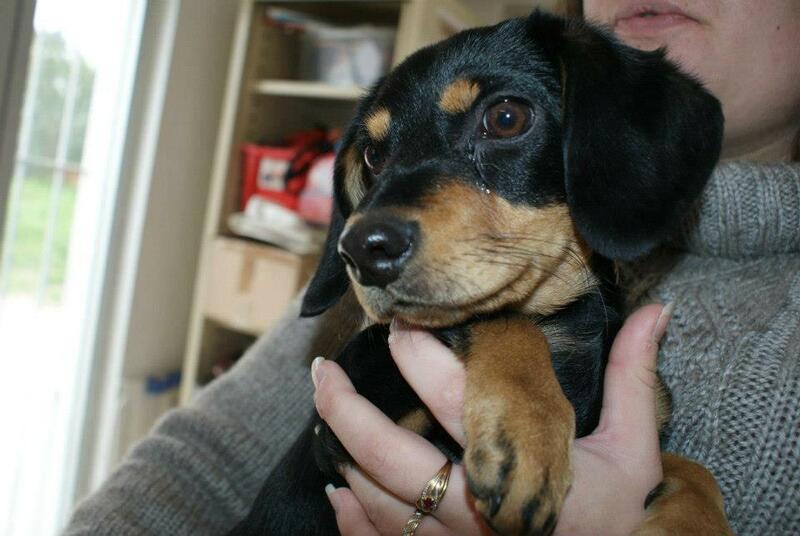 Here is a photo of Pluto, second to last of the Planet puppies to be homed. Just one little girl, Neptune, left. But of course we have plenty of other pups. This couple have never had a rescue dog before and drove 3 hours to collect Pluto, having seen our appeal on the Doglinks site! 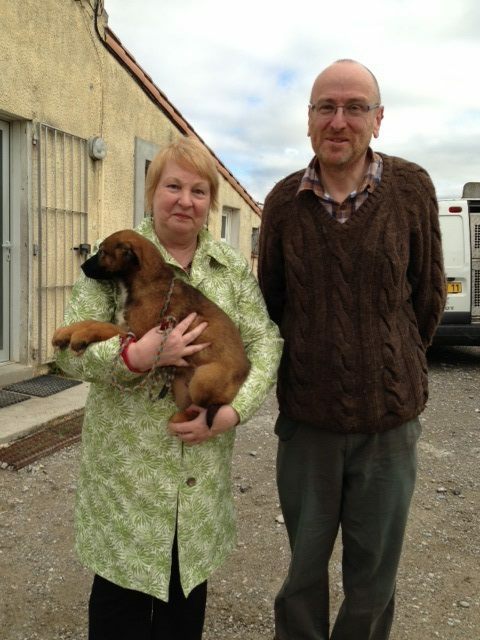 Thanks to all concerned, to Moira for taking up the translating baton at the refuge, to the couple for their long round trip and to Evelyn at Doglinks for publicising our puppy-plight. One by one….. I am away with work for the next few days, but thanks to the wonders of the internet, the blog can go on! Beccasine left as planned, with the French SPA workers and volunteers dusting off their schoolboy English to help out. “My tailor is rich” seems to be a favourite expression, but none too helpful when you are in a dog-adoption situation. The BIG news is that we have been in discussions with the lovely Eline at Animal Trust in Belgium, and in April she will be taking delivery of five SPA dogs. 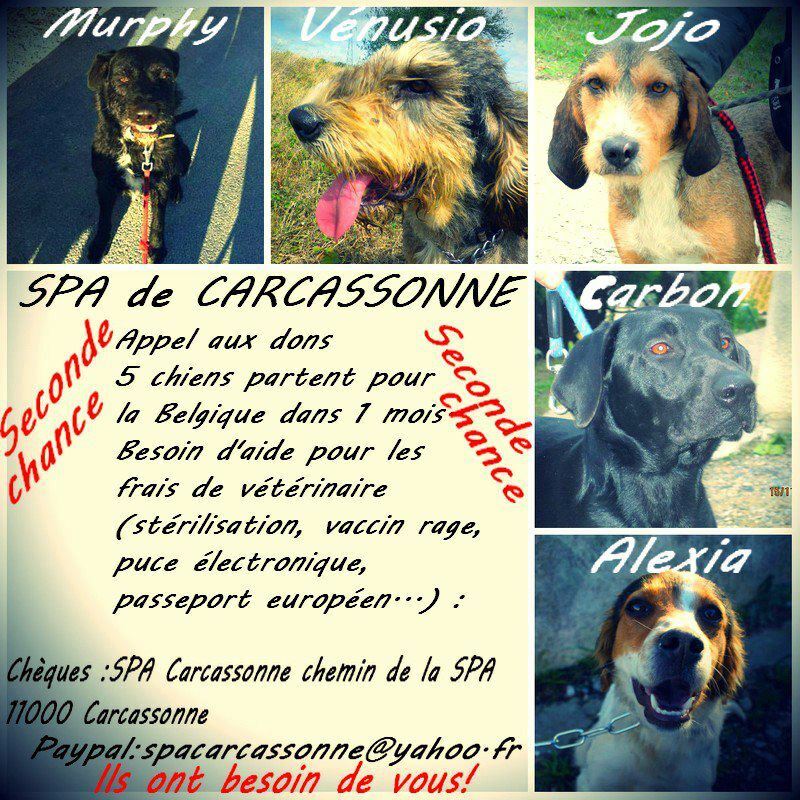 Four of them are ex-chasse dogs (hard to home here, but a novelty in Belgium) and the fifth is Carbon, a black labrador who is starting to give up hope. We do not wish to burden Eline financially, as she is doing us a huge favour (she homed 4 chasse dogs for us last year, too), so we are putting out an appeal to reimburse the SPA as much as possible. All five dogs will leave fully vaccinated (including rabies) and passported. In addition they will be micro-chipped, and (by far the largest expense), either castrated or sterilised. If you can help with a small donation we would be very grateful. Or if you fancy organising a fund-raising for our “Second Chance” dogs, please get in touch! Oh, and by the way, if you had your eye on one of these dogs, they are all still available for adoption. Eline has says she will just choose another one instead! Small dog arrives, lovely dog leaves! 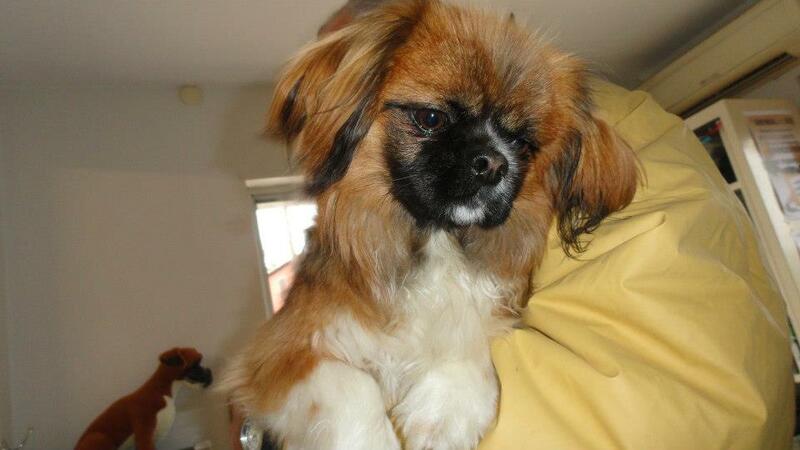 The two main events of the day were the arrival of a small dog, which is either a Tibetan Spaniel or a Pekinese (he hasn’t seen the vet yet, and none of us knows what he is. Except that he is small and furry and neither tattooed or micro-chipped. 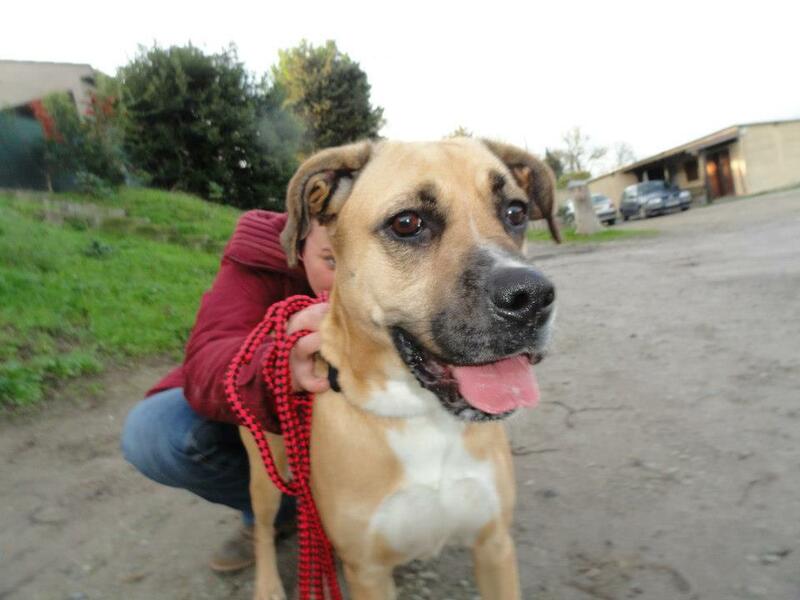 Secondly, lovely Chispa, whose arrival was noted on this blog, left with her new family. And she has fallen on her feet. Chispa was found with air-gun pellets in her legs, which may require future surgery. But this didn’t put her new owners off one bit! Makes a nice change! The weather was awful, though, so we weren’t able to take any dogs out. Let’s hope the sunshine comes back soon! Finally, the right home for this lovely boy! 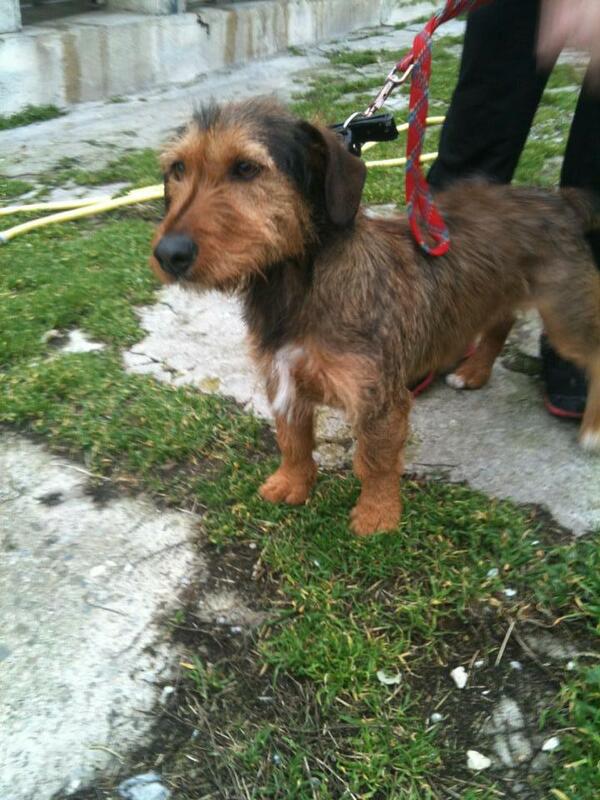 This dog was found in a local rubbish tip along with his brothers and sisters in June 2011. 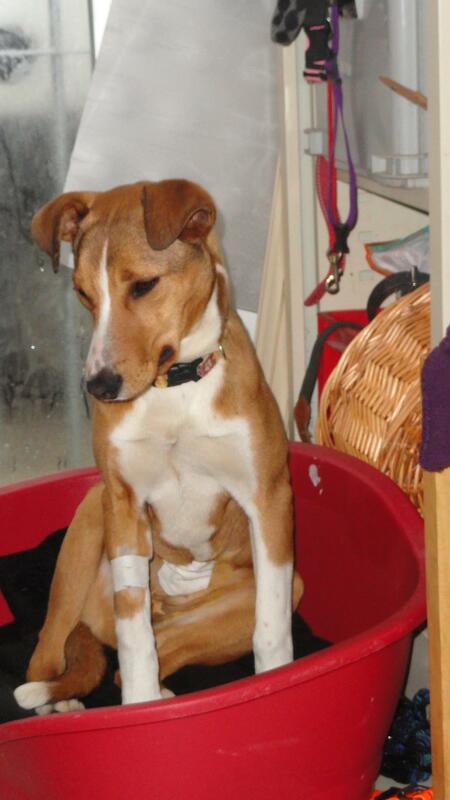 He was homed as a puppy and was well looked after until…(wait for it)…his owners moved to a flat with no room for a dog. So Cortes was abandoned at the refuge exactly one year ago, with glowing references. So why has he been there so long? Because he is black, of course. 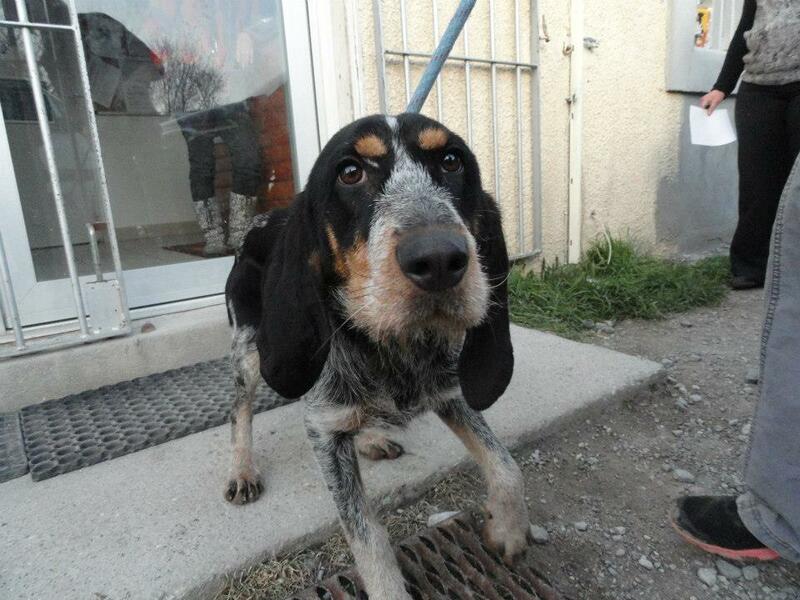 But Cortes has finally been adopted, and best of all, his new owners are neighbours of mine. I pass their house 4 times a day when I walk my dogs. I am so happy for him. We have several more labradors who are just as handsome as Cortes, so if you are not “anti black dog”, like so many other people, please get in touch! We can find you the perfect friend! Beautiful sunshine heralded the first Sunday of the month and our regular open day. The usual devoted volunteers showed up to greet any visitors and to walk the dogs, and our cruelty inspector and cat-lover extraordinaire gave the cat house a deep clean. We and the dogs had a lovely day. Harley spent his day running round in the park with a young female, while his foster carers walked dogs, and we had plenty of visitors too. Beautiful Beccasine (to be renamed Becca, I think) has a lovely new home (have to sterilise her first, or she would have left today), and a couple more dogs were reserved too. Sometimes we question whether Sunday opening is worth the effort, but today I say YES YES YES! Not long to wait, now, Beccasine! As I write this my head is filled with conflicting emotions and I just don’t know what to use as the subject of my post. Do I talk about the collection of food at Geant that has resulted in us being able to cancel our fortnightly dog food order? We had 15 trolley loads of food donated, plus 2 pallets from Geant. The sales in their animal food department went up by 46% during the two days of the SPA collection! And at the refuge the first of the Perfume puppies left, and the family deliberately took the most timid dog, Givenchy, as they knew she would be hardest to home. Then two of our big, black dogs were reserved. (I will tell you who once they have actually left, so as not to tempt fate). So it was a wonderful day, apart from the arrival of this terrified hunt dog. Yes another one. A female this time, but incredibly similar to Gaspard, below. We have called her Greta, and she is beautiful. We will look after her and feed her up and hopefully find her a lovely home. 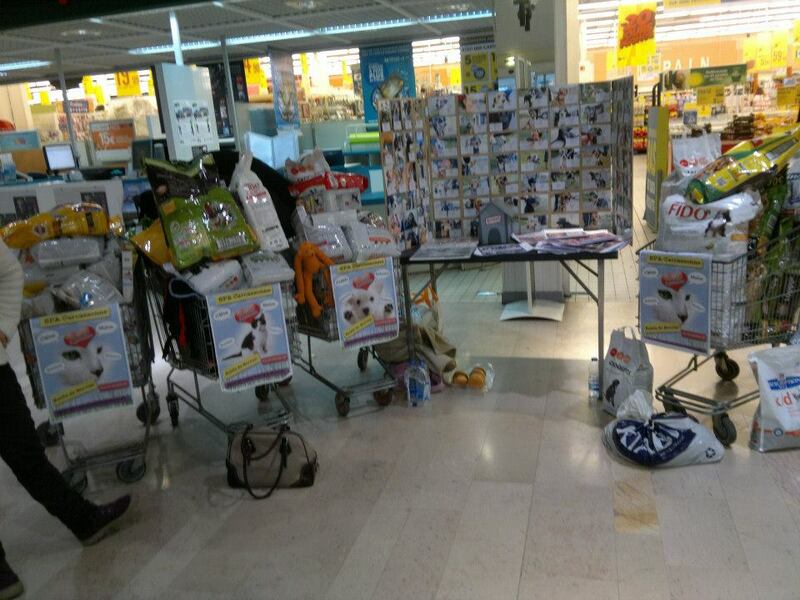 Today we had the first of two days at our local supermarket, Geant, who hosted a stand for the SPA, encouraging people to donate dog food to the SPA. People were so lovely! We were given 8 shopping carts full of dog and cat food, as well as anti flea and tick products and tins of food. Loads of people came to chat and tell us about their pets whom they adopted from us. We had a big board with a display of our dogs (thanks to my husband and his brother, who is staying with us and being put to work!). It was a lovely day and showed that for every person who mistreats or abandons an animal, there is another one who loves them as much as we do. We will be at Geant again tomorrow, and the refuge will be open on Sunday afternoon for the first Sunday of the month, so any late donations can be received there!